Want to prospect for gold but where do I look for finding gold? The leisure activity of prospecting for gold with a metal detector and finding gold nuggets or even tiny flakes of gold has never been more popular and for a very good reason. With the precious metal hovering above $1600 an ounce it is no wonder people are investing big money to buy good metal detectors which will increase their chances of finding gold nuggets. A few small finds. from using a metal detector or from panning for gold, will probably pay for their equipment and leave them with a handsome profit! So the question is where do I start looking for this precious metal, which will obviously be different depending on which country you live in? Let’s consider the U.S.A. A lot of people might think that you can only find gold in certain western parts of the country, like California, the state from which gold prospecting fortunes were made in 1849 by prospectors who struck it rich by finding gold nuggets. However the truth is that you can find gold, whether it be gold nuggets or flakes, in just about any state in the country and becoming a part time gold prospector is a fairly simple hobby to learn and generally an inexpensive one. Basically there are 3 different ways for part time prospectors to find gold in the U.S.A with some being more popular than others. It really is up to the individual prospector to choose the way he is more comfortable with. 1.. Using a metal detector for finding gold nuggets on dry land. 2. Panning for specks or flakes of gold in streams, rivers and creeks. 3. Searching for veins of gold in quartz rocky outcrops using a hammer, pick and chisel. Of the three methods described above the first two are widely regarded as being the best for achieving good results. So having decided upon a method for finding gold nuggets or flakes you should now carry out some research to discover whether gold has actually been found in your state using metal detectors or from panning. Even if the history of your state shows that there have never been gold mines or even any gold deposits discovered it is well worth while checking to see whether there are any gold prospecting clubs close to home. The reason for this is that gold is generally widespread across the country and that river bed systems and former waterways are well worth prospecting, particularly using the panning method. If you intend to pan for gold go online and buy a simple beginner’s gold panning kit. These starter kits are generally very inexpensive costing less than a hundred dollars, and they have everything with which you need to get started. Such items as a plastic pan, vacuum sucker bottle, steel or plastic classifier, gold testing glass vial and even a helpful guide book on prospecting are generally included in the kit. There is also a huge range of metal detectors that you can purchase on the Internet varying in price from a hundred dollars to several thousands. It is very advisable to carefully choose the type of metal detector that you will need for the ground conditions that you will encounter in the areas to be prospected on for finding gold. AMAZON is a great place for doing some research on the equipment you need to buy and to check other readers reviews of the products. 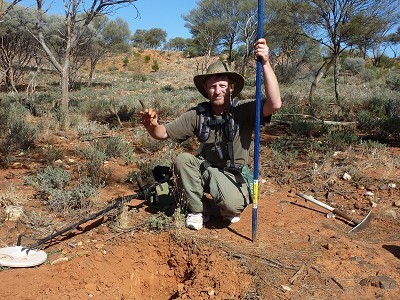 Once you have done your research and selected a good location for finding gold, whether it is a creek, stream or old mining area to get started in, and have learned the basics about metal detector and panning techniques, it’s time to get started! Even though you may feel hyped up and confident of finding heaps of gold be realistic and don’t have too high expectations. Success in finding gold nuggets or gold flakes on your first prospecting trip or even on subsequent ones can be difficult to achieve but you need to persevere and with the experience gained you will eventually be rewarded by uncovering some valuable golden treasure! Hope you enjoy a very successful prospecting trip! This entry was posted in finding gold nuggets, Uncategorized and tagged finding gold nuggets with a metal detector, finding gold with a metal detector, metal detector for finding gold nuggets, prospect for gold by Jim. Bookmark the permalink.